The Blood & Truth release date has finally been given. Sony’s espionage thriller VR title from Sony Interactive London will release on PS4 this May. Blood & Truth will be releasing on May 28th, 2019 for the PSVR platform. The soundtrack is a mixture of classical movie orchestra scores and London grime, fitting perfectly with the game’s setting and tone. Rampage around the melting pot of glamour and grit that is modern day London, against the unique mashed-up soundtrack of classic movie orchestral scoring and London grime, composed specially for the game by leading artists. 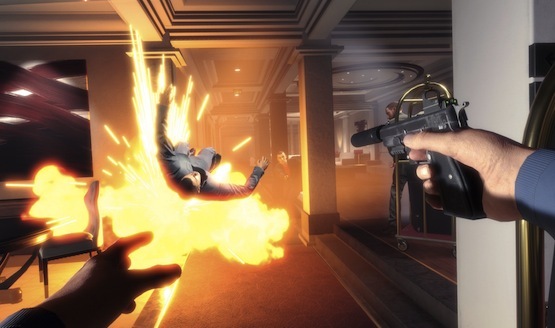 The game was inspired by The London Heist experience from PlayStation VR Worlds. We’ve gone hands on with Blood & Truth at a couple of events, talking about an incredibly immersive VR experience that came from the simplest and smallest of details. The announcement came from the State of Play live stream from PlayStation. PlayStation also revealed a new Five Nights at Freddy’s VR game, an interesting dungeon crawler called ReadySet Heroes, a story trailer for Concrete Genie, more characters confirmed for Mortal Kombat 11, Iron Man VR, Crash Nitro Kart tracks and modes in Crash Team Racing Nitro Fueled, and more. Are you looking forward to trying out Blood & Truth? Did you like the State of Play live stream or were you disappointed by it? Let us know in the comments below!